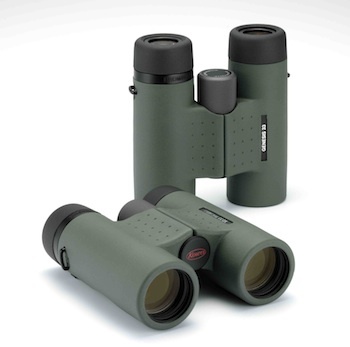 Kowa's Genesis Series XD 44 and XD 33 binoculars are first to use the Prominar brand name, utilizing four XD lenses. The optical technology of the Prominar XD lens has been transferred from spotting scope to binocular while introducing the world of chromatic aberration-free views. The advanced technology of the Kowa Genesis creates a brighter image with the highest contrast for remarkable color reproduction. The Genesis binoculars are waterproof and filled with dry nitrogen gas to prevent your lens from fogging up. They are equipped with diopter lock control that keeps the diopter from accidentally being changed, and they have a close focus of 5.5 feet). MSRP: $1,160 - $1,440. 800/966-5692, www.kowa-usa.com.